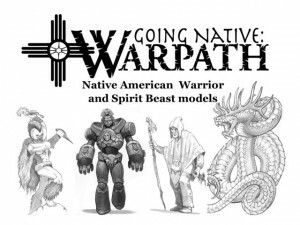 Paymaster Games has made it to over 50% Funded for their Going Native Kickstarter campaign. They've still got 9 days to go to make up the other half. Will they make it? We have reached 50%. That is a fantastic achievement. Your hard work was has been rewarded, the Kallawaya Doctor is off the sculptor and hopefully we will have WIP very soon. We just need to push this up to the final goal. All of your work on the various forums and message boards has be the most useful and powerful tool that we have. Please keep getting the word out. I want to reward everyone who helps out and joins in. To do that I have these gift goals to bring us up to the funding goal. Let’s start with Facebook, new Facebook shares made from the campaign page is tracked by Kickstarter. If we reach 150 shares it will unlock the landed Flying Head and 250 shares will unlock the flying Flying Head. Once unlocked each Flying Head will be available for 1 point each. The next bonus for new backers. Once we reach 55 backers it will unlock the Eastern Woodlands Clan Mother.